PRINTER EPSON DLQ-3000+ TRACTOR FEED. A3 136 Columns Plus one ribbon. Sold as seen. Was working when last used four months ago. Stopped using due to printer upgrade. 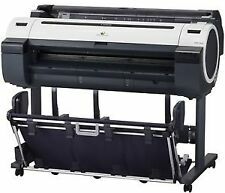 HP DesignJet 500 (24-inch) Large Format Inkjet Printer, new print heads. Condition is Used. It has a fault code: check cartridge but I dont have time to repair it do to work. This printer is probably 7 years old. It would need a service as the ink nosels get dry. We have not used it in a few years. We are moving office and have no need for it. Condition is Used. Pick Up Only. Printer will be removed from stand and stand will be dismantled for easier transportation. All screws present. Small cyan and yellow inks &. Full set of new large inks. AND USED THIS PRINTER REGULAR. DIED AND EVERYTHING HAS TO GO. • Excellent colour and black&white prints – excellent picture quality, high colour stability, and optimal colour graduation. • Color technology - Inkjet. • Printer type - Professional. - PLUS 2 Rolls of Fogra Silk/Matt - 17in paper. 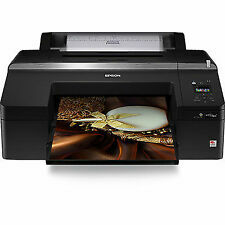 Canon IPF 710 Wide Format Printer. Condition is Used. New Print Head is Required. Pick up details Shepperton House. IMPORTANT: You will have to organise a collection for yourself. 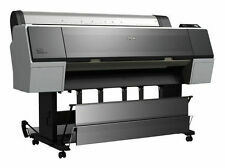 Hp Designjet large format printer. New paper plus spare rolls. USB connection. Paper cutter. All front paper trays plus spares. Front tray A2 A3 A4 trays etc. Roll feed at the back is useful. Can be removed from the stand for transport. Collection in person only from SE10/London Greenwich. Collection will be from 5th April onwards. It's a very large and bulky item so will need a van. Part Number: C2678A. The Printer Broker Ltd is a supplier of printers, fusers and printer parts based in Bolton, Greater Manchester, UK. Perfect for creating glossy photos in sizes up to A3 , it provides the ideal entry into professional photo printing. USB, Ethernet, WiFi. ™ print head. Print Margin. Photo Black, Matte Black, Cyan, Yellow, Magenta, Red, Orange, Gloss Optimizer. HP DesignJet 1050C Plus. 1 x HP DesignJet 1050C Plus. Stand ,Paper Catcher,and Automatic Cutter Included. Parallel & Ethernet Connections. Connections; Parallel & Ethernet. DPI; 600 x 600 dpi Colour. Printer Specification. 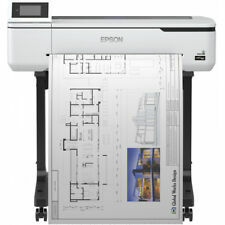 HP DesignJet T2500 eMFP. Multifunction Printer Plotter. 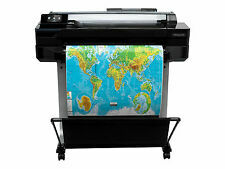 Multifunction Wide Format Printer. USB & Network. 2400 x 1200 dpi Print. 1 x 6 Months RTB Warranty. LCD Screen. Installation and training available at £125. This makes it one of the best quality printers in its price range – but don’t just take our word for it. You can also expect dense, crisp lines and deep black prints, making this device perfect for technical graphics up to 24" in width. HP Designjet 500 24" printer withand network card. We can also swap like for like - installing a fully warrantied product and taking away your broken printer, (or just turn up and service your printer). Printer: 256 MB, Network: 128 MB. 2,880 x 1,440 DPI. Printing Resolution. Print features. USB 2.0 Type A, Wired Network, USB 1.1 Type B, USB 2.0 Type B. 12 months On-site service. Mac OS 10.5.8 or later, Windows 7, Windows 7 x64, Windows Vista, Windows Vista x64, Windows XP, Windows XP x64. About this printer - reducing price item - (see below). swap like for like - installing a fully warrantied product and taking away your broken printer, (or just turn up and service your printer). We hold lots of spares. Has been a good printer for many years. Installation & Training available at £125, just ask! I've tested it by holding down the line feed button whilst switching the printer on. I see FX-2180 are going for £250 but I don't know how much my FX-1050 differs from an FX-2180. But I've just reduced my price down to £120. Refurbished HP T790 24" cad printer. Installation & Training available. Part Number : C7790A. The Printer Broker Ltd is a supplier of printers, fusers and printer parts based in Bolton, Greater Manchester, UK. We can also swap like for like - installing a fully warrantied product and taking away your broken printer, (or just turn up and service your printer). We have nearly 50 years combined experience of HP Designjets - we should know what we are doing. 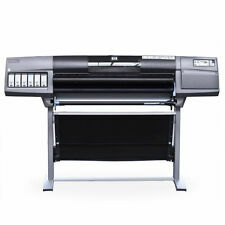 This is the award winning HP DesignJet T120 ePrint - large-format printer. Print technologyHP Thermal Inkjet. automatic cutter. HP ePrint capabilityYes. Power consumption< 35 watts (printing), < 0.3 watts (standby). All operationincluding ink tank changing is carried out from the front, so you never need todisrupt your office no matter where you decided to place the printer. Expect exceptionalproductivity with draft A0 prints available in just 48 seconds. Refurbished HP 1055CM Plus with. Installation and training available at £125. Drivers are included for Windows Win32, and I have been using it connected over a network to a Windows XP machine running as a print server. The lower paper tray can handle both A3 and A4 paper. HP Colour Laserjet M750dn (D3L09A). 93170 Pages printed. Speed Colour Up to 30ppm Colour Print. USB Port Yes. Paper Handling Input 1 250 Sheet Input Tray. Paper Handling Input 2 500 Sheet Input Tray. When a standard computer printer no longer meets the demands of your business, a large format printer, also known as a wide format printer, may be just the thing you need. 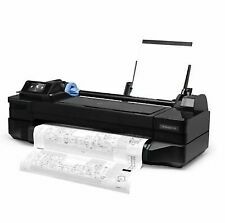 On eBay, you'll find a wide range of computer printers, scanners and supplies to suit your company or place of work. Capable of handling print rolls with a considerably increased width of between 18 and 100 inches, large format printers open up a whole new world of potential when it comes to printing options. From posters and banners to wallpaper and murals, or even architectural drawings and construction plans, they're perfect for creating large-scale signage, graphics, documents and artwork. 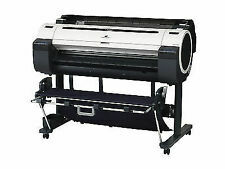 Most of the major technology and printing brands offer large format printers, resulting in plenty of choices. There are models from well-known names like Epson, HP and Canon, as well as smaller but equally well-respected brands like OKI and Oce. Depending on how much you need your printed materials to stand out, you can choose from common and recognisable paper sizes ranging from A5 up to A0. Different connectivity types are also available. Select from wired options with USB ports or alternatively opt for wireless or Bluetooth connectivity based on your network requirements. The large format printers available also feature a variety of technologies, including older, well-established methods as well as more up-to-date printing types. Most common is the inkjet printer, which works by propelling minute droplets of ink onto paper, however, dot matrix, laser and its similar sibling LED are all choices too. Another technology option is thermal, which works by selectively heating specially coated thermal paper. As with most electronic products, you can shop a range of different product conditions to suit your needs and budget. As well as brand new large format printers, nearly-new models are on offer as well as refurbished models and individual parts for those with the skills to modify or rebuild.